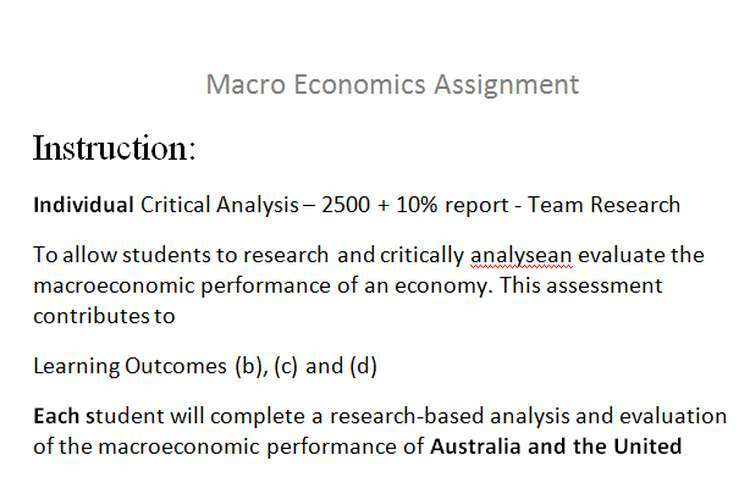 Each student will complete a research report based analysis and evaluation of the macro economic performance of Australia and the United States of America (USA) from 1990 to 2015. Obtain data on key macroeconomic indicators: real GDP, interest rates, unemployment rate, CPI, exchange rate, exports and imports (NX) [Note: All raw data are to be presented in Appendix only]. How is real GDP growth related to the other indicators in Australia and the USA? Explain. Briefly comment on the correlation between interest rate and inflation and interest rate and ?unemployment? In which country has monetary policy been tighter in the past decade? Critically Explain. Write a short prediction of the macro economic outlook each country. Which of the two ?countries, Australia or USA, is more likely to experience a recession or expansion soon? Critically explain. Research requirements: Students need to support their analysis with a minimum of 10 academic journal articles plus the text. Students aiming for a Credit or higher grade will need to use more sources. Articles should be relevant and recent. Non-academic journal sources may also be used, but relevant and validity should be identified with the lecturer/tutor. Presentation: Report format - 2500 + 10% Word report – Word .doc or .docx?Title page, executive summary, table of contents, appropriate headings and sub-headings, recommendations/findings/conclusions, in-text referencing and reference list (Harvard – Anglia style), attachments if relevant. Single spaced, font Times New Roman 12pt, Calibri 11pt or Arial 10pt.